Gene Roddenberry, the creator of Star Trek who came up with those famous words, could well have been talking about the latest generation AirOpus camper rather than the endless state of the wider Cosmos, because the lasting impression of this nimble yet hardy camper is an abiding sense of roominess. In fact, it’s the type of camper Tesla’s Elon Musk, after one of his creative brainstorms, could well approve of being shot into space, allowing the camper cosmonauts inside to float about in its zero gravity interior. 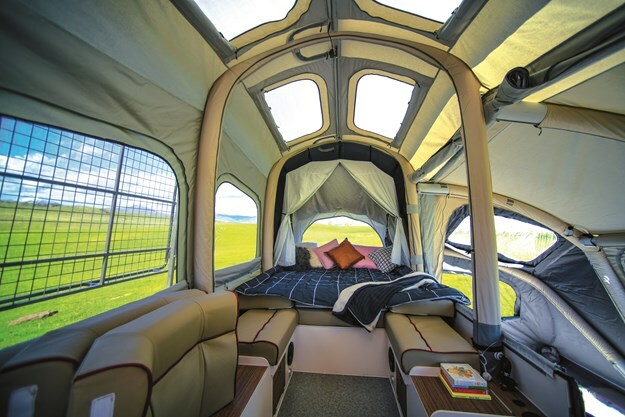 The Opus’ AirBeam system allows for a distinctive large dome-like central tent enclosure courtesy of the solid curved inflating roof beams which, together with well-conceived window ports on all sides, engenders a roominess akin to a bricks and mortar hotel room rather than your typical mobile camper bed and dinette setup. It’s been around for a while now, this breed of inflatable camper trailer and its distinctive air-pressure system of setting up your canvas once ensconced at your campsite — but that doesn’t make it any less appealing. When I first stepped up into the dinette area, I was immediately taken by an unfussiness to the external walls and roof. No poles or tightening widgets and a sparsity of supportive infrastructure. An overall lightness. The space inside, akin to a small hotel room, almost inviting guests to extend their arms outwards, like Julie Andrews gallivanting o-er Swiss mountainsides in the Sound of Music. In fact when shooting the walk-through video for the Opus I suggested that Fremantle ruckman, Aaron Sandilands, one of the tallest player in the AFL, would approve of the Opus’ domed configuration offering increased headroom. But since the finals, its been pointed out that Collingwood (sometimes) high-marking American import forward, Mason Cox, is the tallest in the AFL. While probably not able to ride the back of Sandilands, plucking a ball at its highest point after launching from inside the Opus’ expansive dinette, he’d certainly approve of the effort to increase headroom while inside. It’s certainly refreshing see an innovative camper trailer within the often tight design constraints of the industry. Opus are on the move, changing and modifying their campers in several ways as can be seen in comparison to their previous models the Opus Drifter and Opus All Road. 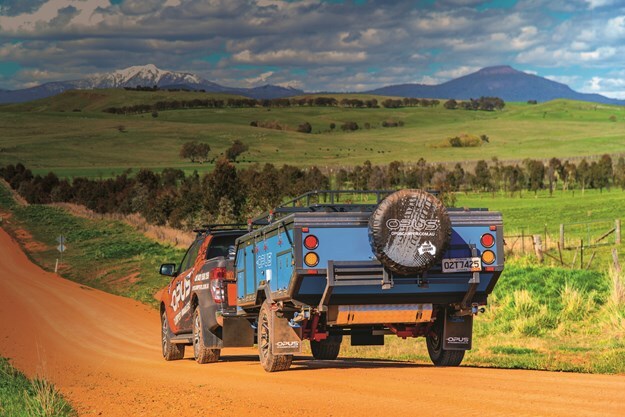 Certainly, as editor of the magazine for the best part of 18 months now, the questions that persist are around what differentiates a certain camper from the pack when it comes to deciding the winners of Camper Trailer of the Year. As all the campers that eventually end up receiving invites are nominally the best of the best anyway, the overall standard of entrants is already very high. Usually the componentry and included features of the campers entered are already top class. The judges have a wickedly hard time deciding which of the excellent, yet similar, features stand out from the crowd. Innovation and design excellence is usually an aspect that appeals. Of course the design embellishments have to work — and more than that — improve on standard design principles. Now, I’m no judge, but the Opus’ AirBeam system, with its quick setup time and capacity to markedly increase roominess, definitely made an impression on me. The specification of the internal living space accounts for 5.8 x 1.9m of living area under the tent, with headroom reaching 2.3m at its apex. Mason Cox is 2.11m, so no stooping of the neck for even him. At each end of the spacious interior, there’s a double bed, with the rear upgradable to king size. All of the well-placed windows feature their own flyscreens, clear window and block-out curtains. The light curtains efficiently screen the beds off from the dinette without impinging available space. In fact, when the screen curtains are drawn back and secured, with the curvature of the roof above and the slightly raised platform where the mattresses sit, there’s a sense of an old-school theatre stage about them. The canvas material itself, 340g micro-weave polycotton, seems best in class. The weekend we took the Air Opus camper trailer away was unseasonably warm and sunny, but no doubt you’d be warm, dry and snug in a total deluge. There’s also a water-proof and UV-protected tropical roof included. The dinette section is centrally positioned between the beds at both ends, with enough space separating each of the sections to allow for those entering the dinette from below to access the storage lockers and electric control panels without interrupting any robust meal-time conversation. Again, the extra headroom and space definitely plugs into benefits parleyed into dinette functionality as well. There’s nothing worse, once settled around a table playing cards or reading a book, than having to unfold the old legs from under a swivel table to accommodate someone’s request for an extra jumper, butterfly net or whatever else. With the space, any potential unfolding of limbs is made less arduous. The windows feature plenty of ventilation, which only adds to the airiness inside. Also, as is the case with most campers these days, the whole dinette seat and chairs setup can be transformed into a third sleeping area, if there’s six adults that need accommodating. And with six burly adults potentially sleeping inside, plenty of ventilation can only be a virtue, winter or summer. The dinette, as is de rigueur for camper dinette design, is U-shaped, the upholstery is thick, leather-type and comfy. Just inside the main door after stepping up from the outside awning area, is a recessed fire extinguisher and the interface unit for the entertainment system with CD/DVD and USB connectivity and two permanently hard-wired speakers fixed inside. To the immediate left as you stand at the dinette entrance is a porta potti enclosed conveniently in its own cabinet. There’s ample storage under each of the padded bench seats, including mounting positions for two 100Ah deep cycle AGM batteries with 240v chargers, isolator switch, air compressor and switch gear for the trailer mover, plus twin water pumps. Similar to the inside, the Air Opus’ AirBeam system is the overriding design feature outside, as well. The absence of hard poles, with their angular appearance and heavy presence, is replaced with the comparatively demure air beam system, offering up a curved and high-set ceiling. During the weekend we took the Opus away, we used the awning section to enjoy a few boards of delectable antipasto. Four adults and two small children had no bother negotiating themselves around the table to gain access to the tastiest morsels. We had some nice locally-sourced rose, too and there was plenty of swinging elbow room for a few robust celebratory ‘cheers!’ (the adults, not the children). As a bonus, the air beam annexe is included as standard with this Opus camper trailer. As is a cold-water pull-out shower (which can easily be plugged into mains water pressure). There’s no hot-water as standard, but there is a mounting bracket to hang one, such as the extra recommended Hot Water Aqua Cube. We spent the weekend in a beautiful paddock just outside Mansfield with a snow-clad Mt Buller emerging from the horizon line like an advertisement for travel Switzerland. So when we hitched the Opus to our tow tug, it was a splendid cruise along some of the state’s most scenic routes. The grass was green and the fringing blackberry brambles were reminiscent to those found in the rolling green countrysides of Europe. The inclines and ruts we poked the tow tug over, around and into, however, weren’t so charming. The Opus bounced over all we threw at her. Much as we tried, the Opus’ relatively light weight, courtesy in the most part to its aluminium frame and composite panel exterior, had it firmly aligned behind the tow vehicle, bouncing assuredly out of every rivet, hole and up and down all inclines and declines. The Opus rides on 235/75R15 offroad tyres and alloy wheels further enhancing its ride smoothness and rugged capability. She’s fitted with 12” electric brakes and separate handbrake, which more than adequately deals with the 1340kg Tare (tent included) and 1800kg ATM. Fill the water tanks, jerry cans and gas bottle, and you’ll still have up to 400kg extra storage capacity. Out front on the drawbar is a polyblock offroad coupling, a swing-up jockey wheel and an Anderson plug connection with regulator should you opt up for a solar panel. Choosing our site upon a splendid rolling green paddock replete with friendly cows, Malcolm had the camper set up and ready for action in minutes. Apparently the main tent and annexe can be up and ready to rock in less time than it takes to slide out the kitchen and whip out the fridge. It’s a simple matter of opening the electric panel to the right of the entryway to the dinette, turning on the main isolator and compressor switch, and then pressing ‘inflate’. This activates a series of rib-like supporting tubes which serve as the tent supporting structures rather than your typical poles. As the structure inflates, you're then free to wind down the stabiliser legs, get your fridge in order and start prepping your meal on the stainless steel, four burner, amply drawered, kitchen slide-out. The kitchen itself features four gas burners, a wind deflector shield, sink with electric tap and heaps of space for all your cooking and BBQ nick-nacks. The air beam system is certainly different and the word ‘air’ suggests lightness but also, perhaps, flimsiness. I can attest we gave it a good work out, punched the inflated beams like Mike Tyson on the heavy bag, and let me tell you, this air beam system ain’t flimsy. Remember, its air and canvas in those massive bags the fire brigade put out under on-fire 40 story buildings to catch people plummeting from windows escaping the inferno. Yes, like a fireman's airbag, the inflatable frame is extremely tough with similarly tough canvas construction. Should you develop a hole or leak, however, the process is a simple case of patching, like how you’d fix a bike tyre. 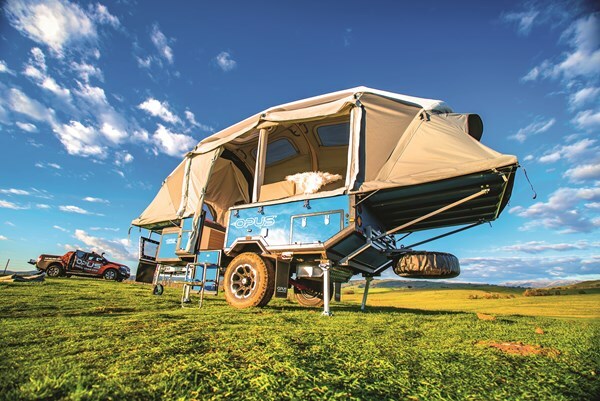 Innovative and super-light in feel as well as measured weight, the Air Opus Camper will satisfy your need to provide a comfortable campsite for both a gentle family camping expedition as well as any gnarlier, river-crossing, rock-hopping ambitions you may harbour. It sets up in a breeze, literally and figuratively, and if you fancy a spot of ballroom dancing while out in the middle of nowhere, the super-high headroom could accommodate a few moves, no drama. Kitchen Stainless steel construction with sink, pressurised cold-water, utensil and implement drawers, lighting and pull-out food prep bench.